© 2016 Steve Feinstein, InMusic Inc.
There’s just no getting around this. If you’re going to understand anything about audio—how speakers and headphones work, the effect of recording studio acoustics, how to position your mics, the concept of bass management/low-pass filters, anything about audio—you have to understand frequency response. This is the cornerstone of everything in audio. It all starts and stops with frequency response. Amplifiers, headphones, speakers/monitors, mics, cartridges on turntables, CD and DVD players, they all have to have as close to perfect frequency response as possible, or else they just won’t sound right. Nothing else matters if the frequency response is no good. Can’t make it any clearer than that. Let’s start off with the basics: Sound waves in the air that we perceive as music or speech or noise are measured in cycles per second, usually abbreviated as Hertz or Hz (in honor of the late 19th-century German physicist Heinrich Hertz, who did important pioneering work in the field of electromagnetic wave theory). Humans can hear from approximately 20Hz in the bass to about 20,000Hz (20kHz) in the treble. (Well, women and young children can hear that high; a middle-aged man is lucky to make it much past 13-14kHz. Your grandfather needs his hearing aid because his ears are toast by 3kHz. That’s why he’s always saying, “Huh?”) Your pooch gets to 40k, easily, which is why ‘dog whistles’ are inaudible to humans. Bats fly around at night with unerring precision by using their super hearing as organic ‘sonar’ (they judge their location/position by analyzing reflected sound waves around them). Bats can hear as high as 80kHz! The relationship between audible frequencies and musical octaves is 2:1 (or 1:2). So if humans can hear from “20 to 20” as the saying goes, that’s a span of 10 audible octaves: 20-40Hz, 40-80, 80-160, 160-320, 320-625 (yeah, yeah, we fudged that one a little, to make the numbers that follow look nice), 625-1250, 1250-2500, 2500-5000, 5000-10k, 10k-20k. For musical reference, Middle “C” is around 262Hz. An octave higher is 524Hz; an octave lower is 131Hz. An audio device with good frequency response is able to play all the low, middle, and high tones correctly—and in the proper proportion to each other—and that’s what tells our ears whether or not this is a high-fidelity unit with rich, vibrant sound. (that’s the range), ± 3dB (that’s the variation). If a manufacturer specifies a frequency response without a ± xdB variation, it should set off a “Danger, Will Robinson!” alarm. No specified dB variation = no value whatsoever. Stating “20-20kHz” by itself means absolutely nothing, and it undermines the believability and credibility of anything else the manufacturer says. Frequency Response: 20-20kHz ±3dB = Good. Nicely done. Meaningful information. Frequency Response: 20-20kHz = bogus, filler, something to hide, trying to pull a fast one. Frequency responses are almost always shown as a graph. This graph is known as the “Frequency Response Graph.”(Clever, no?) You have to know how to read a graph. No excuses. If you paid attention in Mr. Kelleher’s 6th-grade arithmetic class, great. If not, you’ll be sorry now. Look at Figure 1. This chart tells you what frequencies roughly correspond to bass, midrange, and treble sounds. Now, look at Figure 2. The black line is a speaker or headphone with excellent frequency response. The frequency response curve (so-called because a speaker’s or headphone’s frequency response will curve, or roll off, in the low bass and high treble) is pretty flat (“flat” is good, because it means the device is accurate), with no serious peaks, dips or other up-and-down variations. For speakers, headphones, and microphones, ± 2 or 3dB is considered very good. Amplifiers, CD/DVD players and other ‘strictly electronic’ devices should be within ± 0.5 or 1dB at the most. By contrast, the red line in Figure 2 shows a speaker’s or headphone’s frequency response with a big 7dB peak (so-called because the graph looks like a mountain’s peak) in the upper midrange around 6 kHz, which will make it sound harsh and irritating. Figure 3 shows what response curves look like that correspond to various commonly-used subjective descriptions. For those of you who already know all this stuff, what this paper does is give you an easy way to present it and teach it to others who don’t know it. 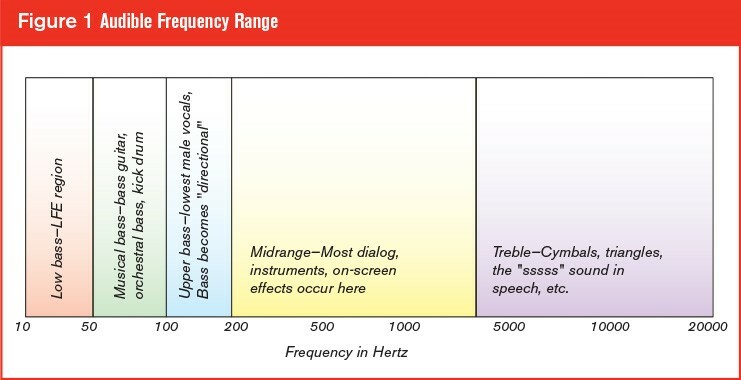 For those of you who don’t really know this yet, if you learn this basic info on frequency response, the relationship between frequency and musical notes and octaves, how people hear, and how these various audio terms look as frequency response graphs, you’ll be well on your way to a meaningful understanding of our audio equipment.